Drought response planning can help a region prepare for droughts and minimize a drought’s economic impact – but only if planning is done responsibly. Responsible drought management practices can help ensure that our essential water needs will be met, even during the driest times, while minimizing the need for new environmentally damaging and expensive infrastructure projects. The most effective drought response management method is to conserve water by reducing nonessential water use. However, many water planners overlook water conservation strategies and instead propose costly approaches that include building enough dams, pipelines and pumps to fully supply even the most extravagant uses of water during severe droughts. Constructing new water supply capacity solely to meet nonessential water uses during severe droughts is a fiscally irresponsible use of public dollars. In addition, these water infrastructure projects that are built to meet peak demand during summer months often negatively impact the health of our rivers, bays, fish and wildlife. Read more about the environmental impact of water infrastructure projects. Building new reservoirs to supply water to meet peak demands during drought is also a poor use of limited water resources. Reservoirs result in greatly increased levels of evaporation of water for our rivers. For example, during 2011, water evaporation from the LCRA’s Highland Lakes was over 190,000 acre-feet. These evaporative losses were close to twice the amount of water the City of Austin used during that year (107,000 acre-feet). Increasingly diverting water from rivers and streams during drought periods directly reduces river and stream flows at times when flows are already low and fish and wildlife are at risk. By limiting nonessential water uses during peak demand periods in summer, water suppliers can reduce the amount of water that must be diverted from streams and rivers or stored behind reservoirs. This allows more freshwater to flow downriver and into our bays during these critical dry periods, which is essential for aquatic species and for the seafood, recreational fishing and nature tourism industries they support. Reducing nonessential uses, such as lawn watering and car washing, during peak demand periods is also a valuable tool in reducing the size of the necessary infrastructure, resulting in tremendous economic savings. What does it mean to reduce nonessential water use? In a 2012 survey of 18 Texas cities, The Texas Living Waters Project found water use increases by an average of 58 percent during the summer months, primarily because of landscape watering. If these 18 cities could reduce this increase by just 25 percent, they could save a combined 147 million gallons every day during the summer. 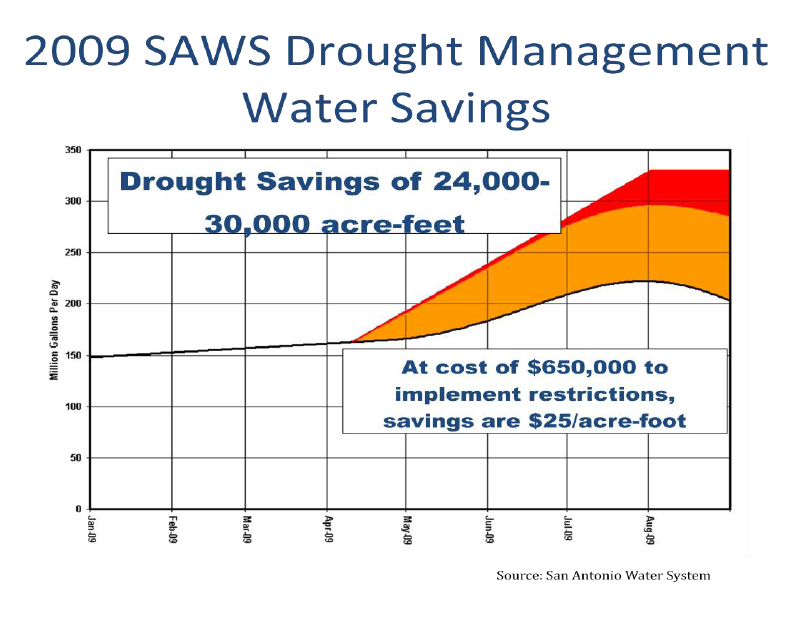 For example, San Antonio drought restrictions reduced the city’s total water use by an estimated 24,000 to 30,000 acre-feet during the extremely dry year of 2009. This reduction was on top of San Antonio’s already low per-capita water use. Implementation of these restrictions to meet water needs cost an estimated $25 per acre-foot, which is many times less than the cost of developing new water supplies to meet summer peak demand. 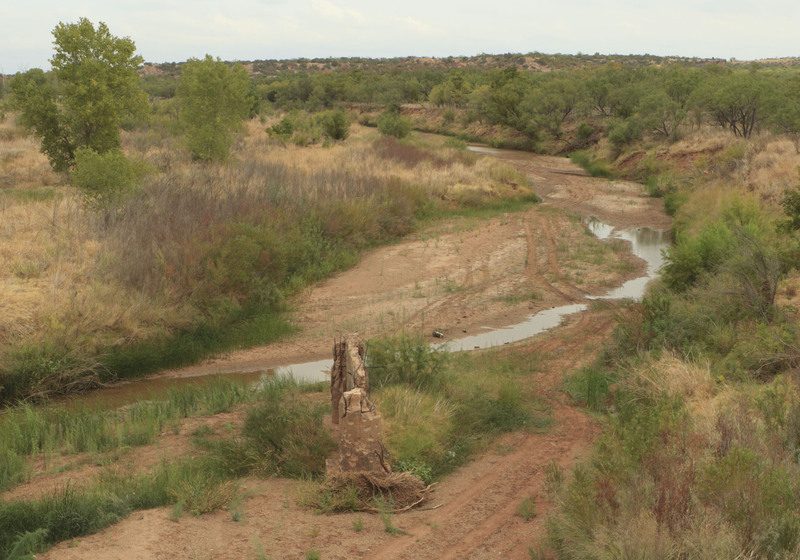 In addition, thanks to drought management measures, water use in Lubbock during the 2011 drought fell by 25 percent.